Place the coconut milk, cashews, ginger, fish sauce, chilli and soy in a small food processor and process until well combined. Place the chicken in a bowl, add the coconut milk mixture and toss to coat. Cover and marinate in the fridge for 1 hour. Thread the chicken onto the skewers. Heat a large non-stick frying pan over medium heat. 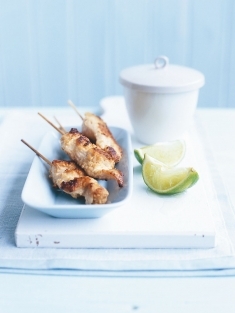 Add 1 tablespoon of oil and cook the skewers, in batches, for 2−3 minutes each side or until cooked through. Serves 4.